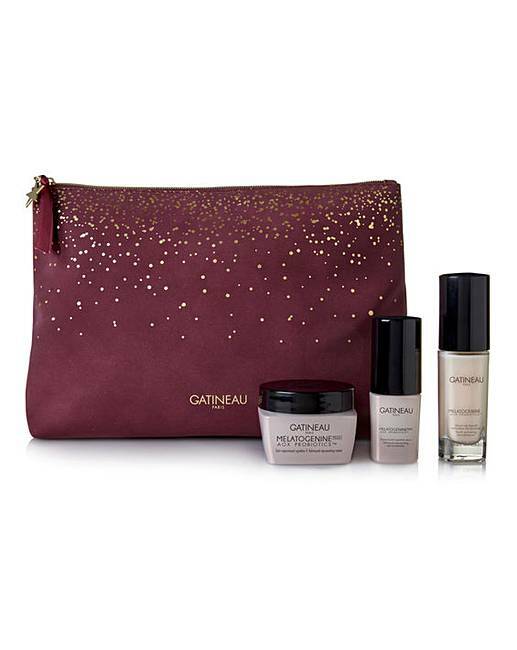 Gatineau Melatogenine Rejuvenating Set is rated 5.0 out of 5 by 1. A gift that guarantees professional results. Gatineau's Melatogenine AOX probiotics range combines the cell plumping power of the youth activating molecule, Melatogenine, with the microbiological shield of probiotics and anti-oxidants, protecting cells from free-radical damage. The ultimate layered defence system to prevent the early signs of ageing. Gift set contains: 50ml Melatogenine AOX probiotics advanced rejuvenating cream, 30ml Melatogenine AOX probiotics youth activating beauty serum, 15ml Melatogenine AOX probiotics advanced rejuvenating eye concentrate and an application spatula in a toiletry bag. Rated 5 out of 5 by Feebs from Love,love,love this set! I am delighted to be able to buy Gatineau Melatogenine sets from your Beauty section! I really can't praise this item highly enough. It suits my extremely dry skin to perfection and it is the only moisturiser to do so. A tiny amount goes such a long way, I use it twice a day, morning and night, and it leaves my face feeling so comfortably hydrated that I am unaware of it. Anyone with dry skin can relate to that. The extras in this set are a beautiful bonus, as is the disappearance of fine lines and pigmentation spots. Highly recommend!